In this post we will learn about TestNG Suite test. A Suite in TestNG is commonly represented by one XML file, usually named as testng.xml. <suite> tag is the first tag in XML file which represents a suite and it may contains one or more <test> tags. Each <test> tag in turn may contain one or more <classes>, <packages>, <groups> tags and more. Let’s begin. When TestNG runs a suite, it basically reads the content of this file and executes the tests based on conditions defined in this XML file. Above Suite defines two <test> tags namely ‘front-end’ & ‘back-end’. Each <test> tag contains packages with specific package names. When TestNG will run this suite, it will look into all these packages to look for test classes and methods to run. In this particular example, it also says that front-end and back-end tests can be run in parallel. Note that tests within one category (front-end e.g.) will still be executed in single thread. Even more information on testng.xml is available on Maven Surefire Plugin & TestNG post. 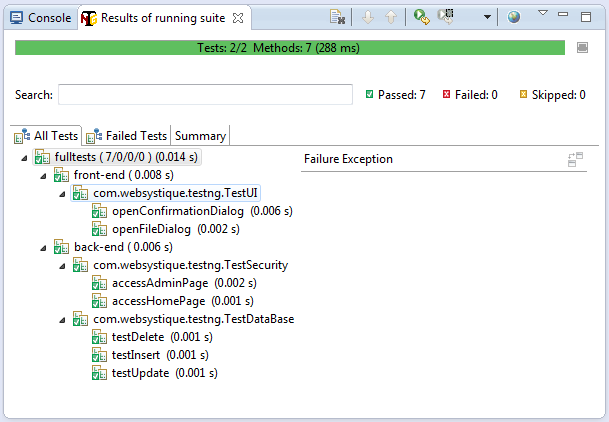 Method annotated with @BeforeSuite is executed only once, before any of the tests method execution in a given suite. It is an ideal place to do some setup/initialization for environments which will be shared among all tests of this suite. Method annotated with @AfterSuite gets executed only once for a suite only after all of the tests of that suite finished execution. Method annotated with @BeforeTest is executed only once, before any of the tests method execution in a given <test> tags which may contain multiple classes and packages. It is an ideal place to do some setup/initialization for environments which will be shared among all tests defined in this <test> tag. Method annotated with @AfterTest gets executed only once for a given <test> tag, and only after all of the tests of that <test> tag finished execution. What we see here that there are two <test> tags categorized as front-end & back-end. Front-end contains only one class and the back-end contains three classes. So it makes sense to define one @BeforeTest/@AfterTest Methods pair in front-end <test> tag and another @BeforeTest/@AfterTest methods pair in back-end <test> tag to provide separate setup for these two categories. About @BeforeSuite & @AfterSuite, we can define them in any of the 4 classes as all 4 belongs to one suite only. It does make sense to define the @BeforeTest/@AfterTest methods in a separate config class for each <test> tag containing more than one class. It makes things manageable as @BeforeTest and @AfterTest logic is common among all test methods of all classes/packages defined under that <test> tag. Otherwise whenever you might need to change the logic of @BeforeTest, @AfterTest, you need to look in all classes to find one which contain these methods. For @BeforeSuite/@AfterSuite, you can place them anywhere. Usually, the config class of one of the <test> tag is an ideal candidate for these methods.